Grilled flank steak stuffed with veggies and covered in a fragrant chimichurri sauce straight from South America: Now, that's enough to get me excited about cooking outdoors! Imagine you're an Argentinian gaucho out there on the range, looking for something to add flavor to your dinner of grilled beef. You find some cilantro growing over here, maybe a little parsley over there, a little garlic, a little oil. 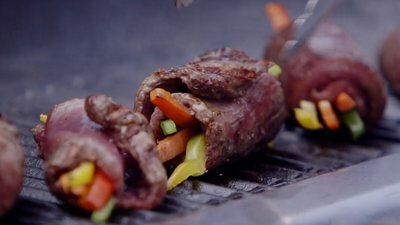 Mix it all up and spoon it across that grilled flank steak stuffed with fresh veggies. Take a bite, lean back, and bid an early "Buenos Dias" to grilling season!